LAST week, environment ministers from around the world met at the United Nations Environment Assembly in Nairobi, with one of its agenda being to agree an implementation plan towards a pollution-free planet. 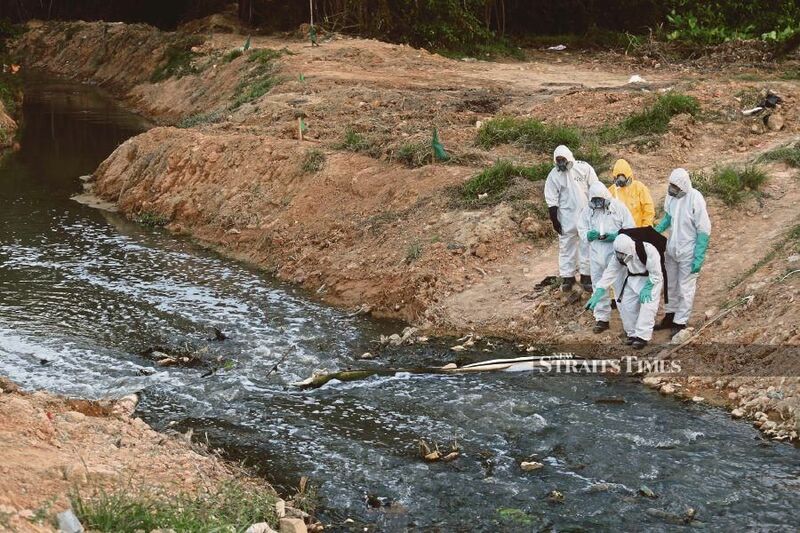 At the same time, almost 4,000 people were reportedly treated for inhaling toxic fumes due to the dumping of hazardous wastes into Sungai Kim Kim in Johor. In recent times, environmental issues have become mainstream, evidenced by the Sustainable Development Goals (SDGs) being agreed to in 2015 as the overarching international development agenda at the United Nations. In Malaysia, environmental policies have evolved from addressing pollution since the 1970s, towards grander aspirations to achieve green growth. At the implementation level, however, the reality is that we are still stuck in the first hurdle in grappling with the most basic environmental protection issues. In 2017, the Department of Statistics revealed that 90 of 140 rivers monitored for levels of biochemical oxygen demand (BOD) were classed as polluted. Air pollution continues to plague the region, with an Air Pollutant Index (API) reading of 143 recorded in Kota Kinabalu on Saturday. The incident at Pasir Gudang is a stark reminder that environmental issues should not be confined to a small group of environmentalists but should concern us all. Sampling of Sungai Kim Kim identified chemicals that are hazardous to our health at high levels of exposure. While the focus now is to treat victims that suffer from acute illnesses, such as respiratory problems and skin irritation, what is worrying is that the pollutants can result in chronic illnesses. Some of the chemicals are carcinogenic — which can cause cancer — as well as affect internal organs such as causing liver damage. History tells us that we should not dismiss this as a one-off event. The Bukit Merah rare earth radioactive disposal led to at least eight leukaemia cases and several cases of physical defects in newborns. More recently, bauxite mining in Kuantan led to complaints about air and water pollution, including contamination of water treatment plants. Sungai Kim Kim itself was already known to be polluted. According to water quality and modelling specialist Dr Zaki Zainudin, who has been monitoring the river for nearly 10 years, “it was an open secret that the river had been turned into a dumping site since 2012”. Its long-term impact on the health of those affected is still poorly understood. And what about the cases in different localities that we are still unaware of? As the remedial actions continue, we should not lose sight of the need to not only prevent such disasters from occurring, but to also restore our environmental health as a whole. To reorient ourselves towards this path, we should align our policies to principles that are enshrined in international environmental law. FIRST , is the precautionary principle, where scientific uncertainty should not be used as a reason not to take any action. The potential impact in the form of chronic illnesses is a point in case where despite it requiring further research to establish causality, a “better safe than sorry” policy should proceed. In parallel, efforts by the scientific community and government to monitor and understand these phenomena should be intensified. The consolidation of data from various agencies announced by the Energy, Technology, Science, Climate Change and Environment Minister Yeo Bee Yin is a promising step. SECOND , is the prevention principle, where the focus is eliminating or reducing pollution from being released into the environment at source, before the recycling, treatment or disposal processes. The Pollution Prevention Act of the United States established an Office of Chemical Safety and Pollution Prevention that facilitates tools and processes for companies to implement prevention at source. THIRD , is the polluter pays principle, which includes both direct and indirect costs. The initial cost of the clean-up of 1.5km of Sungai Kim Kim alone is reported to be RM6.4 million. If you add the potential costs of further clean-up, hospital treatment, monitoring and business closures that will have to be borne by the government, businesses, individuals and society at large, it multiplies further. Moving forward, these principles should be enshrined within our domestic policies and law. Under the Environmental Quality Act 1974, the maximum fine is RM500,000. In addition, the practice of granting contravention licences to industries provides a disincentive to install pollution control equipment as the cost of the licences is often cheaper. From an individual rights perspective, attempts to sue the responsible companies are made more difficult due to the fact that the right to a clean and healthy environment is not enshrined in our Constitution. As the saying goes, prevention is better than cure, and while the firefighting approach is needed to solve the crisis in Johor, a longer term strategy is needed to protect our citizens. This requires strengthening or replacing existing laws and policies to address environmental pollution. Ultimately though, the effectiveness of any policy lies in its implementation. Where it hits the bottom line, in any part of the world, it is only natural to expect vested interests to attempt to influence the enforcement process. However, in the New Malaysia, hopefully this practice is consigned to the past, especially in relation to issues that impact our ability to pursue a long and meaningful life, such as our environmental health.